SF Salt Company Selected for ABC's Third Season of "The Taste"
San Francisco Salt Company Gourmet Chef Salts Selected for ABC's Third Season of "The Taste"
SAN FRANCISCO, Dec. 4, 2014 /PRNewswire/ — San Francisco Salt Company is very excited to have their gourmet chef salts in the kitchen of ABC's third season of "The Taste." The season premieres this Thursday, December 4 at 8pm/7pm Central and airs weekly until February 2015. 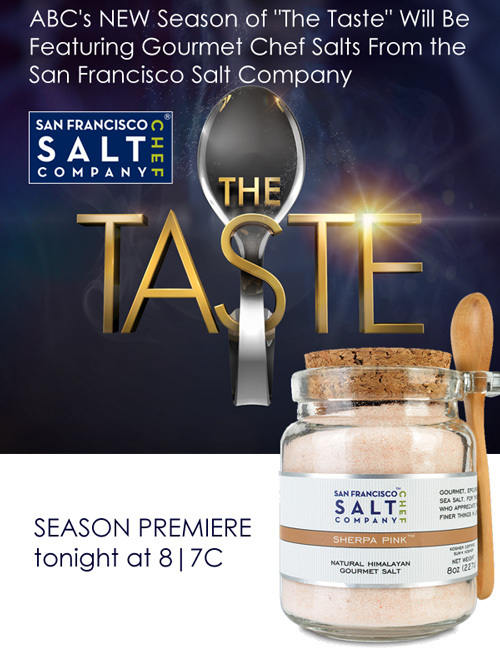 SF Salt Co. is anxious to see how each contestant utilizes the gourmet salts to help season their dishes to win the grand prize. Contestants will be challenged to create dishes that will impress the judges' panel with just one spoonful of their dish. Each week there will be a new theme and each contestant will be pushed to their creative limits. Their fates lie in the hands of the celebrity chef judges: Anthony Bourdain, Nigella Lawson, Ludo Lefebvre, and Marcus Samuelsson. With these esteemed celebrity chefs judging and mentoring the contestants, there is much excitement for everyone involved. With ancient Himalayan Salts, French Grey Salt from the Guerande Marshes of France, and many other delectable salts, the contestants have the cream of the crop of gourmet salts at their disposal to help elevate the flavors of their personal creations. SF Salt Co. gourmet chef salts are not only of the highest quality, but they have an element of beauty, from the stunning and delicate texture of the Cyprus Flake Salt to the deep color of the Alaea Hawaiian Salt. The contestants have the perfect ingredient to enhance both flavor and presentation. Since 2002, SF Salt Co. has been the source for amazing natural salts from around the globe. Founder, Lee Williamson, wanted to share his passion for bathing in natural sea salt with the world. SF Salt Co. started with a retail store at the famous Pier 39 in San Francisco, where patrons can smell and touch each of the 30 signature bath & spa salts to create their own individual salt selections. As the company grew, so did the product line and Williamson added the gourmet salt division, allowing SF Salt Co. to accommodate any salt needs, ranging from retail products to bulk wholesale. "As a big fan of 'The Taste,' I can't wait to tune in and see what amazing creations the chefs will come up with," says Williamson. "It's rewarding to know that 'The Taste' has recognized our brand as being a leader in the gourmet salt market by trusting us to supply one of the most important ingredients in their kitchen." SF Salt Co. invites viewers to watch the progress of each contestant and share comments on their Facebook page (www.facebook.com/SanFranciscoSaltCompany). Pick favorite contestants and follow along to get inspired by the creative uses of the gourmet salts in the amazingly delicious dishes created by the contestants. Be sure to visit the SF Salt Co. website //www.sfsalt.com to check out their original recipes inspired by the dishes on "The Taste."